By Melissa Lennig on July 27, 2013 11 Comments. This content contains affiliate links. As an Amazon Associate I earn from qualifying purchases. The fields that surround our home are in full bloom. Wild Bee Balm, Black-eyed Susan, Goldenrod, and Wild Carrot blow in the breeze, attract bees, and fill the landscape with flashes of color. 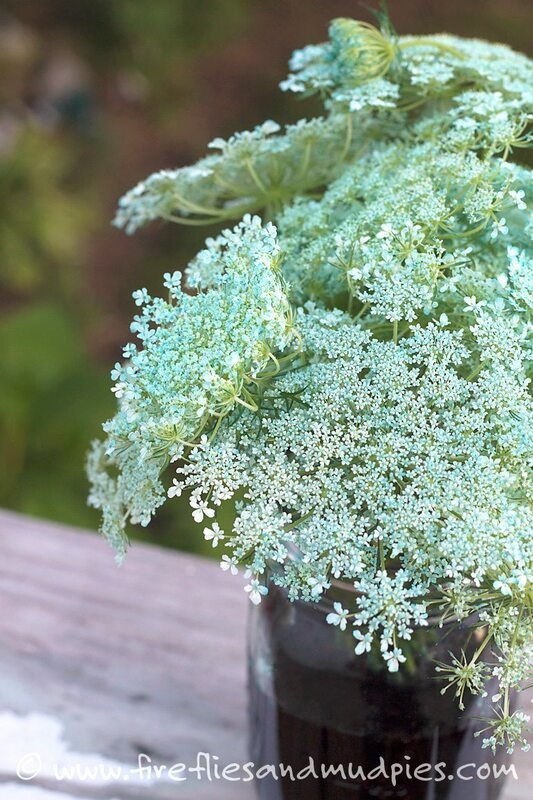 As we were taking a walk through the fields the other day, I wondered if Wild Carrot would change color if given tinted water to drink, like Carnations and Daises. 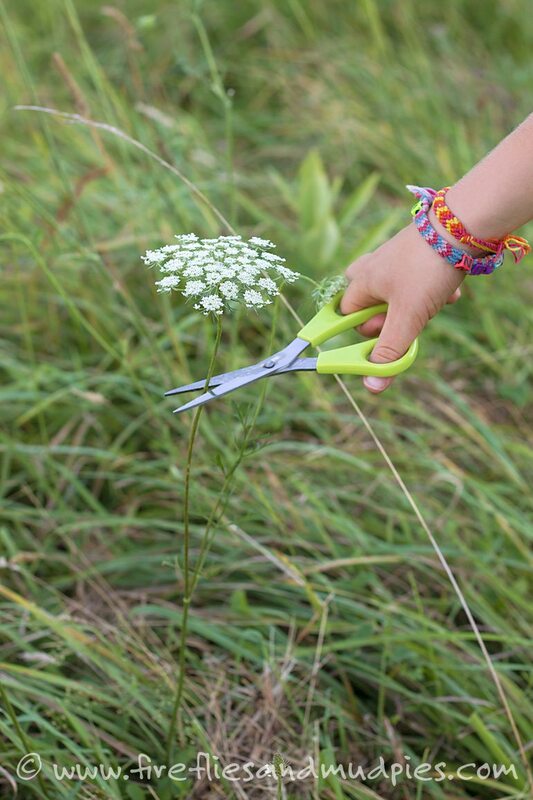 The next day, we brought scissors on our walk so that we could cut plants and try coloring Wild Carrot at home. 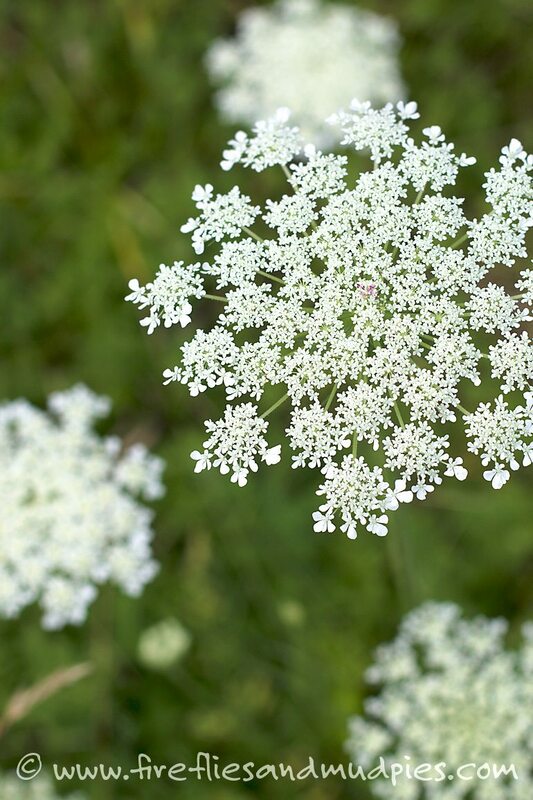 Wild Carrot, commonly known as Queen Anne’s Lace, is a biennial flowering plant that naturalized to North America from Europe. The domesticated carrots that we enjoy today were once cultivated from Wild Carrot. We harvested Wild Carrot using scissors, as the stems can grow thick and be hard for young children to pick with their fingers. Some people report skin irritation when handling Wild Carrot, but we did not experience any trouble with this. 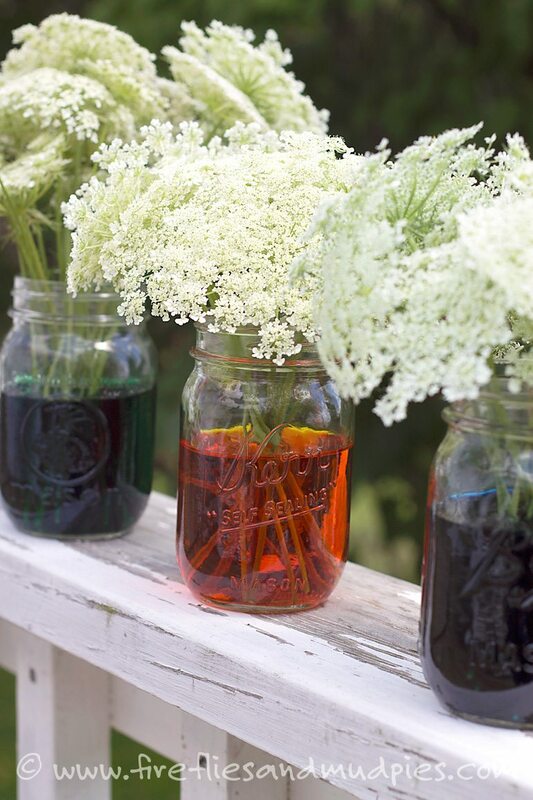 We brought our bouquets home and prepared colored water using household food dye (liquid watercolor will also work). We used about 30 drops of dye in each jar of water. I cut the plants at a diagonal slant under water to prevent air bubbles from blocking the xylem inside of the stems. When cutting all flowers, always use diagonal slants to prevent the stems from sitting flat on the bottom of the vase. Eight hours later, our bouquets had changed color! Plants use cohesion and capillary action to pull water up through the xylem that runs through a plant’s stem. 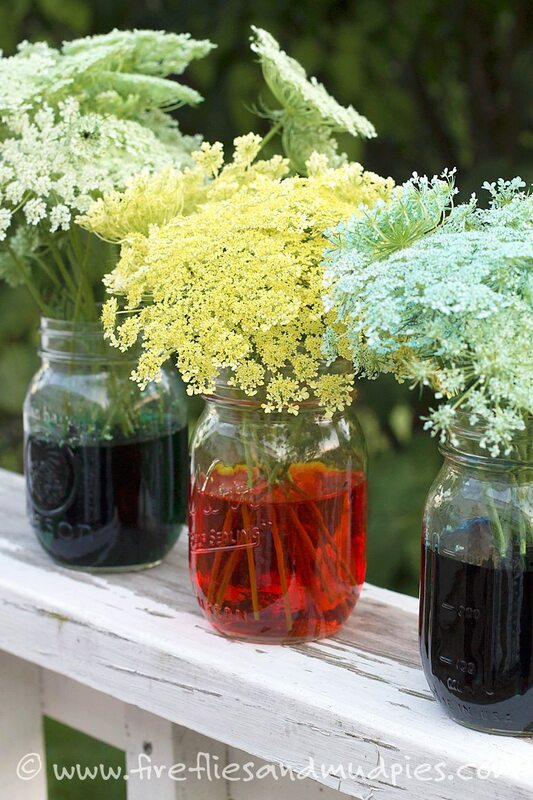 As the plant transpires, water evaporates from the flowers leaving the color behind. 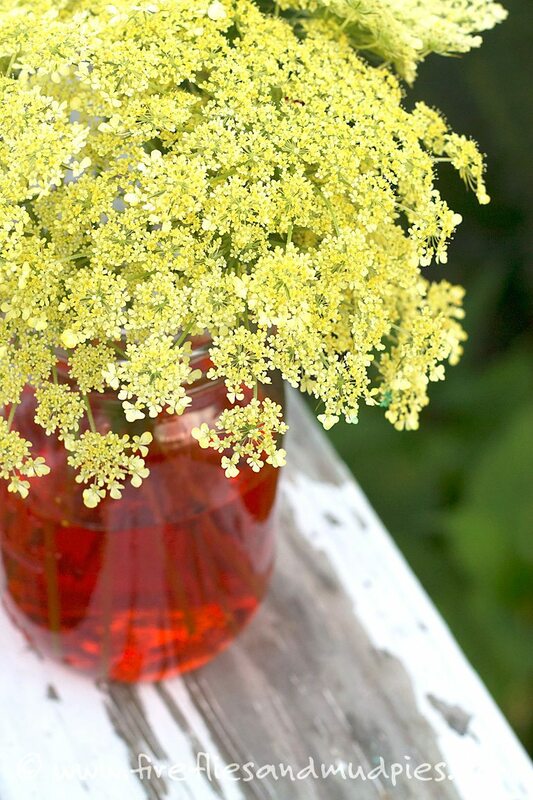 I simply can’t get over how vibrant the yellow Wild Carrot bouquet is! What a fun summer science activity! 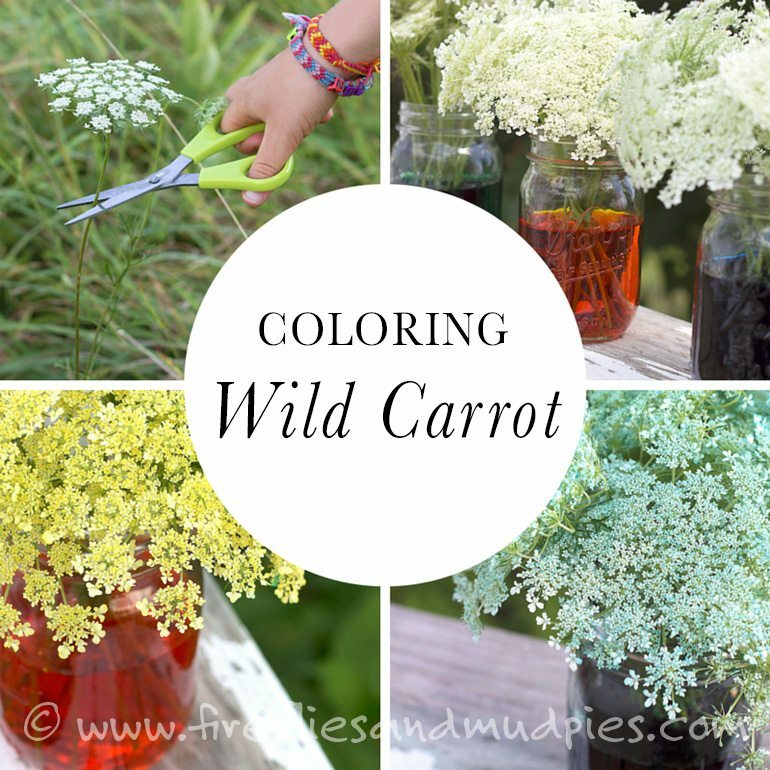 I hope that you too will try coloring Wild Carrot with your children or class—you won’t be disappointed! 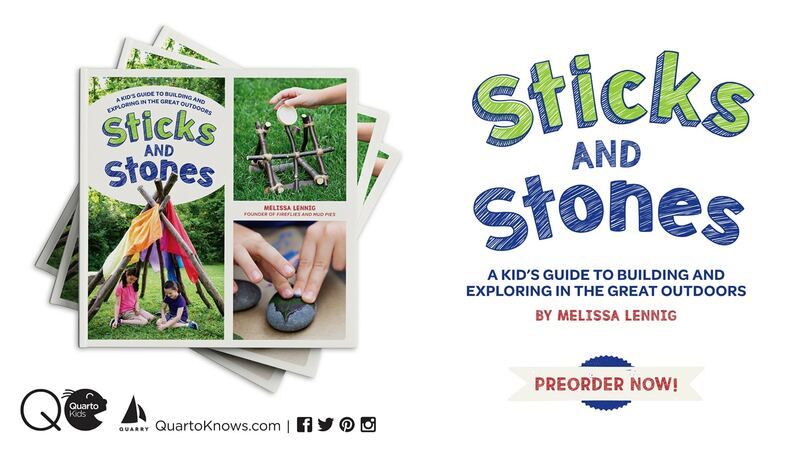 To see more posts like this, follow along with Fireflies and Mud Pies on Pinterest, Instagram, Twitter, and Facebook. We just did this experiment this week too! With the same colors! And our purple didn’t work either. The blue and green look very bright and colorful, but not the purple. Interesting.